… not what truly is. Colors in context are a great example. They visually shift and fluctuate, in an ever moving dance with the colors and light around them. 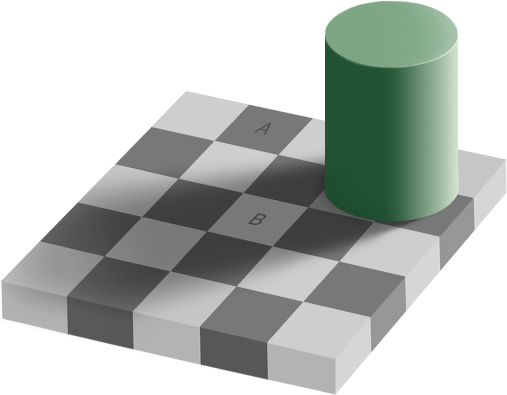 Square A and Square B are the same shade of gray, the same color. Oh yes they are! 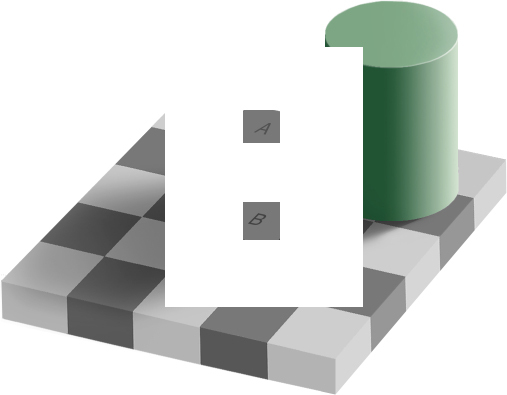 I can’t see it, either: my mind cannot reconcile the fact that they are exactly the same, because B is the lighter square, even though it’s in shadow (so my mind tells me). Here’s proof that they are the same. I covered up the surrounding area– the context. Now it’s easy to see that they are the same (click image to see larger version). A dear friend and her husband run a commercial & residential painting company. They tell me great color and people stories. One of my favorite, and a frequently occurring one, is the client who looks at two different walls painted in the same color and vehemently accuses their company of using two different paint colors. Because walls in a room face different directions and they receive light differently: one may be in more shade, the sun may be setting casting a very bluish or pinkish light on the other wall. Several factors may be involved. But the paint on each wall came from the same can. Its the same color. We have a lot of fun in my color classes debating which color is lighter, darker, more intense, less intense. Its a bit easier for us to answer those questions because for the most part we are comparing swatches of flat color to each other in the same light. They aren’t any rigid context, like these checkerboard squares. I share this issue with you to remind you that when you are dealing with color: COLOR IS RELATIVE. The color you think you see is relative to the colors surrounding it, the atmosphere, the lighting…many factors. You see what you think you see, not what truly is. Being conscious of this empowers you to make more conscious, informed color choices. Ok, I seriously didn’t even believe it even with the example shaded out. So I had to copy the file and actually cut out the squares and place them next to each other to see it. That is super trippy! I should say, I copied the file and cut the squares out in MS Paint. I guess it would work the same if you printed it too. Janeen, I still have to prove it to myself when I haven’t looked at this in a few years. i use it in many of my classes. Its quite an eye-opener! Thanks for reading. Wow…that is hard to believe. By the fact that the checkerboard pattern lighter-darker-lighter-darker. So then all the darker are A’s and lighter are B’s. The B is in the middle of four A’s. And the 4 A’s aren’t the same color as the B in the middle. So if I believe you ladies, and I do… and I read this statement and I did. Since I read this and realized what is happening, and I know that the colors are the same, because I believe you, why can’t I see them as the same color since my mind knows they are now? Because of the *context*. From the time we could first see we learned that even though a white square may be in the shadows, it is still a white square. So when we see the B square – the lighter square – in the shadow, we are assuming it is still lighter than the A – the inherently darker – square. When you look at a photo of a person wearing what you think to be a white shirt in a dark room – you see a white shirt. If you measure the “white” of the photo, it will turn out to be a gray or a blue, nowhere near white. But your eye will register a white shirt because your mind knows he’s wearing a white shirt. Your eye & mind make compensations to make sense of the world around you. Its a GOOD thing! Otherwise, we would be distinguishing only patches of color and shape, and not be able to determine depth, distance, and understand what we are seeing. I’ve read about these kinds of brain disorders, and they are a frightening way to live. Phew…I had to cut it out…My husband couldn’t believe it, either. Can’t wait to show the grandchildren. That one is really something. Thanks for the explanation. I am still not sure if I can wrap my mind around it fully. It makes sense when I read, but I still can’t grasp why when I tell myself it is dark, it still doesn’t look dark. And it seemed when I cut it out it gradually changed colors, almost like the paper what treated and changing when it hit the lite. Thanks again. The one is gray the other is white gray I’m not buying into this. The second picture is a fake! Thanks for blogging this. I was just telling a friend about this color phenomenon and needed a visual. Your comments are great. You’re welcome, Lauren! Thanks for reading.